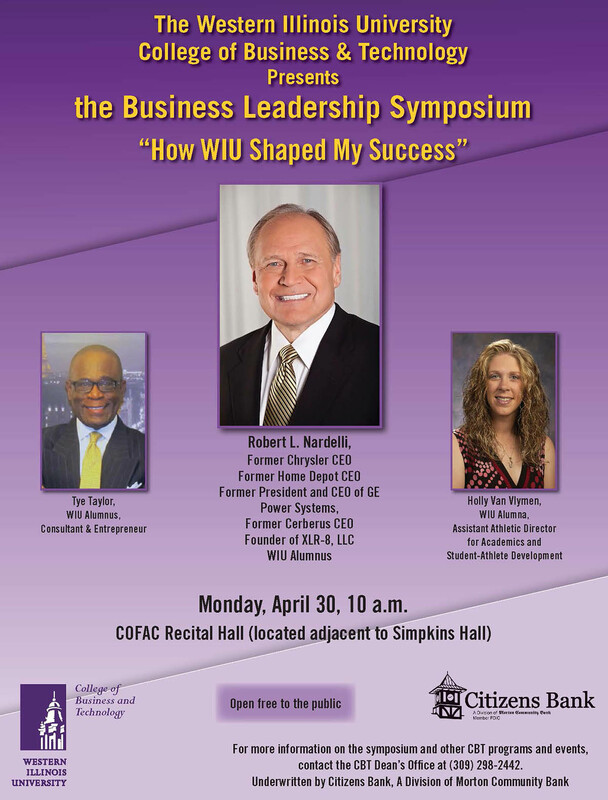 MACOMB, IL -- The Western Illinois University College of Business and Technology will host the inaugural Business Leadership Symposium Monday, April 30. The event is underwritten by Citizens Bank, A Division of Morton Community Bank. WIU Alumnus and Founder of XLR-8, LLC Bob Nardelli will be on campus as part of the symposium to speak to numerous business classes. Nardelli, along with WIU Alumnus Tye Taylor, consultant and entrepreneur, and WIU Alumna Holly Van Vlymen, assistant athletic director for academics and student-athlete development and former WIU Softball head coach, will each share how WIU set the foundation for their successes. The panel discussion, which is open free to the public, will begin at 10 a.m. in the College of Fine Arts and Communication Recital Hall (Simpkins Hall). "The leadership team of Citizens Bank is honored to be strategic partners with Western Illinois University in sponsoring the College of Business and Technology Business Leadership Symposium," noted Citizens Bank President Todd Lester. "We are so appreciative to Mr. Nardelli and to the Western Illinois University administration in bringing the University and Macomb community together for this wonderful opportunity to network and learn from such a successful graduate of our fine institution." Widely recognized as one of the best operating executives in the United States, Nardelli, a 1971 business graduate, has grown the sales and profits of a number of multi-national corporations. During his nearly 30-year tenure at GE, he quadrupled operating profits for GE Power Systems. He then doubled the size of The Home Depot as CEO, and helped save Chrysler and its iconic brands when the American auto industry began to collapse. His new firm, XLR-8, LLC, Investment & Advisory Co., combines his 40-plus years of experience augmenting business performance with a team of professionals that has unparalleled skills in fixing and growing companies. A member of the President's National Advisory Board, Nardelli was a three-year letterman on the Leathernecks football team from 1968-70 and was co- captain and an all-state and all-conference performer in 1970. Taylor, a 1979 mass communication graduate, serves as an economic development and governmental consultant, as well as a management, marketing and research consultant for The Consulting Group, LTD in St. Louis, Missouri. His career includes corporate management roles at Verizon, Metlife, SBC Corporation and AT&T Corporation, among others. A member of the WIU Alumni Council, Taylor is a former Leatherneck high jumper and current record holder (7'1", 1978 ). Van Vlymen, a 2000 education graduate, was named the assistant athletic director for Academics and Student-Athlete Development in Fall 2017 after serving as the WIU Head Softball Coach. In eleven seasons, Van Vlymen led the Fighting Leathernecks to the school's first NCAA Tournament win, three regular-season conference titles and a Summit League Tournament Title, as well as being named the conference's Coach of the Year three times. She was inducted into the Western Illinois Athletics Hall of Fame in 2012 and was one of the most dominant pitchers in the history of WIU and the Mid-Continent, now The Summit League, Conference. Van Vlymen was named both an NFCA All-American and GTE Academic All-American in 2000 and played professionally for one year after completing her collegiate eligibility, helping the Ohio Pride to a second place finish in the Women's Professional Softball League. "We are excited to offer the first Business Leadership Symposium to our students, and to bring three outstanding alumni together to demonstrate how their athletic and academic achievements have translated to success in business," added CBT Interim Dean Jack Elfrink. "The College of Business and Technology greatly appreciates Citizens Bank for underwriting our inaugural Business Leadership Symposium." For more information on the symposium and other CBT programs and events, contact the CBT Dean's Office at (309) 298-2442.